Karen’s Kolumn is written by Karen Dolley our local area public health nurse… we appreciate her knowledge and her willingness to share! The holidays have arrived and many people are making purchases for the special children in their families. That is why December has been designated Safe Toys and Gifts Month. In 2005, more than 200,000 toy related injuries were reported. About 8,000 of these injuries were eye injuries. Always consider the safety and age range of toys purchased. The United States Consumer Product Safety Commission closely monitors and regulates toys. But it is up to all of us to choose toys that are safe for the age of the child and to choose toys that are most appropriate for their individual skills and abilities. Avoid toys with small parts and toys that could shatter into small pieces if broken. These can be choking hazards. If a toy or a toy part can fit into a paper towel or toilet roll holder, it is too small and can potentially be a choking hazard. Avoid toys with sharp edges and points, guns and other toys that shoot flying objects and make loud noises, toys with ropes or cords, and toys that have heating elements. Never buy a toy that could be a fire hazard. All crayons, markers, and art supplies should be labeled nontoxic. Stuffed toys should be labeled washable. Look for a label marked with ASTM. These toys have met the American Society for Testing and Materials standards. No one wants to spend their entire holiday trying to figure out how a toy goes together! Make sure all instructions are easily understood. If you are going to give a sports item as a gift, consider providing safety equipment as well. Toys imported from other countries and older toys may have high levels of lead in the paint or in the plastic. Children naturally put all objects into their mouths. They are easily exposed to lead paint and dust. Even small amounts of lead can be harmful to a child. Educate yourself about lead exposure from toys. Check to see which toys have been recalled before making a purchase. Be aware that older toys may be sentimental to us but can contain lead paint. And encourage frequent hand washing before, during, and after play. For more information about toys and childhood lead exposure, go to www.cdc.gov. After a toy is purchased, inspect it frequently to make sure nothing is broken or loose. Make needed repairs or throw broken toys away. The MOST important thing a parent or caregiver can do is to supervise children while they play. For more information on toy recalls, go to www.cpsc.gov. For more information about toy safety, visit www.safekids.org or www.preventblindness.org. And to all, have a Happy and Safe Holiday and New Year! Congratulations to Mrs. Foster for being named Maine School Nurse of the Year! Awesome! For, after all, put it as we may to ourselves, we are all of us from birth to death guests at a table which we did not spread. The sun, the earth, love, friends, our very breath are parts of the banquet…. Shall we think of the day as a chance to come nearer to our Host, and to find out something of Him who has fed us so long? Valley Grange has been a strong supporter of the “Read ME” program since it’s inception. Developed by the Maine Agriculture in the Classroom organization, the program involves volunteers reading and giving out agriculturally themed books to Pre K to 4th Grade Classrooms. This all takes place during Ag Week, March 14 – 18 2011. Again this year, Valley Grange is working to schedule classes in concert with Sheila Richards of the PSWCD. Our Bookworms have volunteered to handle S.A.D. 4–Piscatquis Community Elementary School. Teachers/administration from other districts might want to check out the program at the MAITC site where there’s preliminary information about the program and forms to request classrooms be included. Those in Piscataquis or Penobscot counties might also considering contacting Sheila by email or giving her a call at the PSWCD office in Dover Foxcroft. 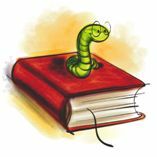 While Valley Grange Bookworms believe we’ve got Guilford covered, there may be a need for volunteers in others schools and districts… this is huge fun and it’s only one day a year so being a volunteer just makes sense! Again, check with Sheila and see what the opportunities are! 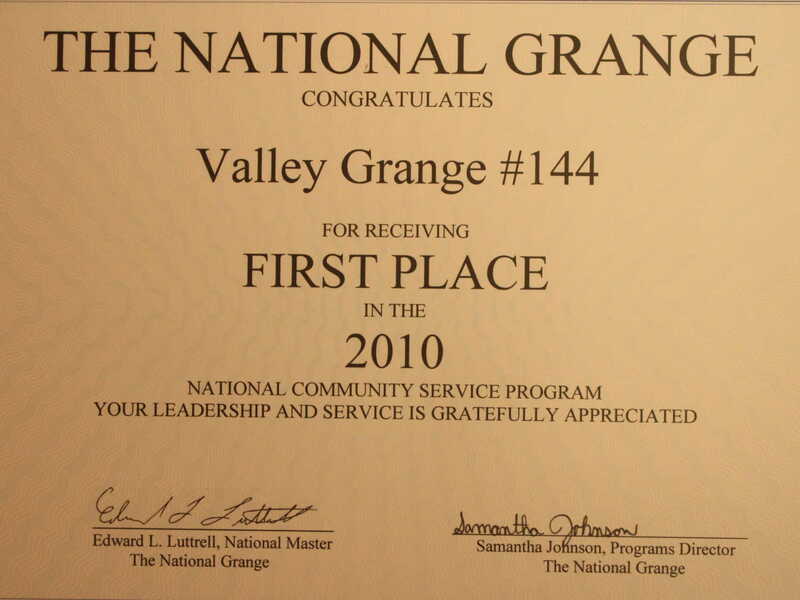 Valley Grange Is NUMBER ONE! A shocked Mary Annis, Community Service Chairperson, accepted the award admitting she “never dreamed we’d really win.” While Valley members are justifiably proud of their community service program, the competition for the national honor is fierce with over 2,000 granges in 37 states vying for the coveted award and first prize stipend of $400. Lecturer/Program Director Walter Boomsma noted that to a large extent the “work is the reward” and he thought perhaps next year’s theme would be “practice random acts of community because it really is about just that: community.” Earlier in the day he and Grange Master Jim Annis had completed this year’s Words for Thirds” program by traveling to Lagrange, Milo, and Brownville handing out dictionaries. “So there’s a lot to celebrate,” he said as he turned the program over to Susan Ramsey and her “accomplices” for some fine foot-stomping fiddle tunes as well as popular songs from country, folk, and gospel genres with a sprinkling of fun back-and-forth banter and educational snippets. 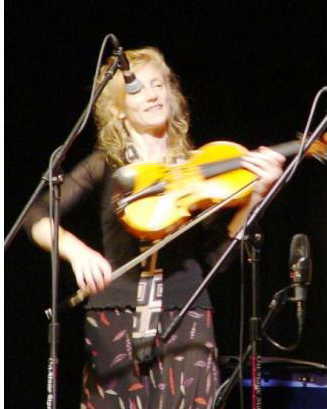 Thanks to Susan’s remarkable talent, the audience discovered that fiddle can imitate a bagpipe and, if you close your eyes, you might not know the difference! During intermission the annual raffle was drawn with the result that Cheryl Ricker of Wellington will receive her choice of whether her prize check will be made out for “meat or heat.” Grange bakers donated a number of pies for an old fashioined pie auction and thanks to the able assistance of the Homachuck Children from Dover Foxcroft an additional $65 was added to the proceeds from an evening meant to be “tons of fun” while raising much-needed funds to keep the Grange solvent and successful. View the ABC 7/FOX 22 Newsclip! View the Piscataquis Times Article by Sheila Grant! I was looking for a grange cookbook–dont know what the cover looks like but it has over 350 pages. My mom had one and it is in rough shape. (She passed away in 2001.) There is a recipe by a member of your grange Mrs. Merwin Lander (Master’s wife). Page 99 has a recipe for five minute fudge. The recipes are from granges all over the United States. Okay, folks… anybody know anything about this cookbook… or better yet have one? It sounds like it might have been published by National Grange based on the fact the recipes are from all over the United States. Any help or information you can offer can either be entered here using the comment feature or you can email me and I will forward it to Lori. Let’s show her how helpful Grangers are! Update! After lots of help both from grangers here and on the MSG site, we helped Lori find her cookbook! Lori says, “Thanks for your help… it was the right one” and she’s very happy! We always enjoy the fat envelope of thank you notes the kids send and we can’t resist sharing a few with everyone. 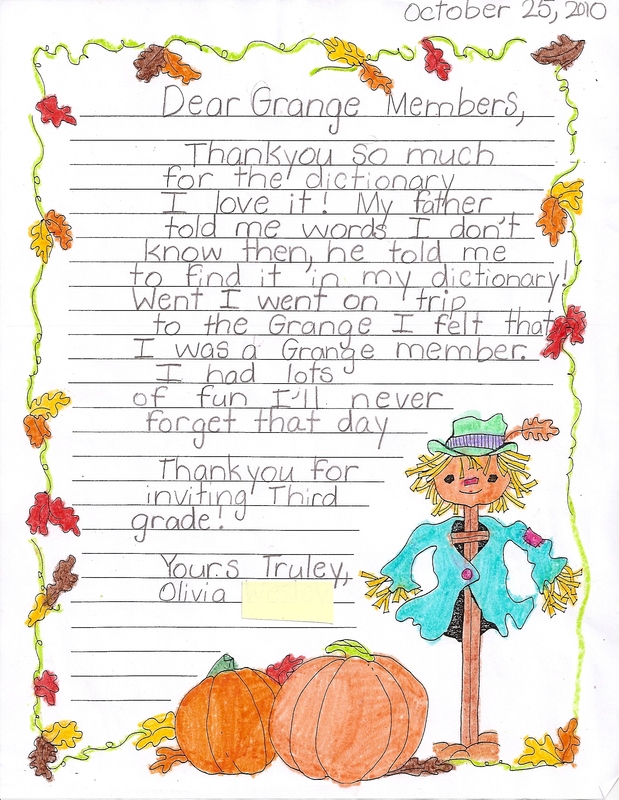 Certainly Olivia is enjoying her father’s challenges and her disctionary and we hope she’s right that’ll she’ll never forget the day she visited the Grange and got her dictionary! I loved the presentation, I learned what the spud,owl, pruning hook, and shepherd’s crook was used for. Every night I’m going to go on a word hunt if I have time to read. First I ask my little sister what word she wants. Next, I look it up. Then, I say what word I want to look up. Then I read the definition for it. Thank you so much for the presentation. I learned a lot. One of the things I learned was that the grange is about farmers. I’m going to use my dictionary for looking up stuff about animals. Thank you for inviting me to your work. I learned about the civil war. I will use my dictionary for everything. Thank you for the presentation you showed us about your grange. I learned about some of the tools you use in the grange. I will use my dictionary for looking up words to study and look up what word mean. I loved visiting the Valley Grange! I’m very pleased that you let all of us come to the grange this year. I learned a lot of stuff about the civil war. And I will use the dictionary for lots of things. Thank you for the beautfil dictionary. Me and my brother Tucker have a game with the dictionary. My brother calls out a word and I find the meaning. Thank you for the dictionary. It was veary nice of you to give them to us. I use it for words. My mom was happy that I do not need to asking them all these words anymore. I love that we got them. I love to look in that book. I loved the trip we went on. I like the sgt part. It was so cool. I love all of it. Thank you for the dictionary. I plane to use the dictionary for writting pecis and letters and for work to do at school. I loved the trip to the grange and avrething that you told us. I lernd a lot on Friday at the grange. I had a lot of fun on Friday. The North Country Strings, led by Susan Ramsey, welcomes and entertains audiences for the Valley Grange’s “Hootenanny” with fine foot-stomping fiddle tunes as well as popular songs from country, folk, and gospel genres with a sprinkling of fun back-and-forth banter and educational snippets. It’s good music done well, featuring something for everyone. Part of the show involves sing-a-longs in which North Country Strings performs well known tunes bound to bring back memories and get the audience singing, clapping, laughing, and feeling great! Tap your toes and fill your tummy! The program starts with grange goodies served at a 6:30 PM “Happy Hour” and refreshments will be available throught the evening. Everything is by donation so this is an affordable evening of family fun! Proceeds from the refreshments will help support Valley Grange’s Words for Thirds Dictionary Program so you’ll even feel good about helping with that!